Leading High Performance Teams is a 2-day Masterclass designed to equip established managers and leaders with the skills they need to have an immediate, positive impact on their teams’ performance. 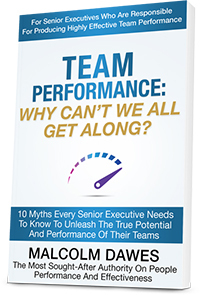 This book is designed to help you dispel the 10 myths that most executives have about unlocking the true potential of their teams. If you’re an executive or manager wanting to transform your team into a “world-class” high-performance team, then this is the book you have been looking for. World renowned performance and leadership expert. Malcolm is the most sought after authority on people performance and effectiveness. He is an expert in showing managers and leaders how to increase their interaction effectiveness through behavioural change. For many years, Malcolm has experienced first-hand the struggles leaders face with accelerating the performance of their teams. He has appeared on numerous radio interviews, in the Australian Financial Review Business Magazine and on TV’s “The Profitability Channel”. Throughout the span of his career, Malcolm has worked across a wide variety of industries including pharmaceutical and medical, retail, banking and finance and a variety of small to medium businesses. In Malcolm’s book Team Performance: Why Can't We All Get Along? Malcolm dispels 10 myths that many senior leaders have about unlocking the true potential of their teams. He highlights core issues of human nature and shows how understanding behaviours as a leader and co-worker is the key to team effectiveness. This masterclass contains examples of real-world experiences from all levels of people in a wide range of industries. Malcolm is passionate about helping businesses find the elusive answers to their people issues. Malcolm’s training course is the best interpersonal skills program that I have been on. While some programs spend time categorising people into personality types, his program identifies your strengths and weaknesses and, more importantly, what you can do to improve. It has been over a year since I attended his course and I still use the skills he taught me each day. I have worked with Malcolm on several occasions and have found him to be very professional and personable to work with. He is an excellent facilitator – working well with both senior management and front-line employee groups. He has demonstrated in depth knowledge of subject areas and used this knowledge effectively in design and delivery of training courses. I would not hesitate to work with Malcolm again in the future.